Probably the most popular of all the lawn mowers is the walk-behind variant that will give you plenty of options to mow your lawn. These are generally two-stroked mowers that have the ability to cut yards of lawn continuously without any interruption. Moreover, these mowers can run for years and they require very low maintenance too. The ideal size of the walk-behind mowers is 20” to 22”. You should always measure the length and width of the garden along with the size of the yard gate so that you don’t have any problem while using the mower. These mowers are hugely popular when it comes to mowing golf courses and landscapes. They are easy to use as they offer high-speed cutting and can turn very precisely. There will be two lap bars that you will act as the driving wheel. You have to maneuver the bars carefully to make sure that you are mowing the right areas of the lawn. If you have a huge lawn that has got big obstacles such as ponds or trees, then a zero-turn mower will be the right choice. With the fast mowing capability, it will be easier to cut down the grass in a relatively short period of time. This will allow you to mow a large area very quickly. Push mowers are the most common in houses that have a small garden in front with grass in it. These mowers are small in size and you have to push them manually to cut the grass. The blades are attached between the two wheels and they are appropriate for mowing small patches of grass in the garden. There is no engine to operate this mower. So, you will have to push it around the areas that you want to clean. The standard size of these mowers is 16” but you can get a bigger variant that measures 20” or even a smaller variant that measures 14”. One of the benefits of the push mowers is that they are really affordable. Their price varies from $80 to $110 because of their manual operation and size. There are various pros and cons of buying a gas or electric motor-powered mower. First of all, electric mowers are absolutely a gem because of their precision and cleanliness. They are easier to operate and do not create any mess while you mow. However, they can run out of power if you don’t have two batteries. The corded mowers are still okay but the size of the cord will be a challenge. But if you are using cordless mowers, then you need to have a couple of extra batteries charged up. Gas mowers, on the other hand, can be more powerful and precise and electric mowers. According to Discover Ziehler, they have the ability to last longer but there are a couple of factors that can get in their way. First, they require frequent maintenance so that the gas does not run out. You have to constantly check the level of gas left in the mower so that it does not stop working all of a sudden. The second thing is it creates a lot of mess while cutting the grass. That is something that the electric mowers do not have. You will have to keep cleaning the grass after mowing for a few minutes so that the blades can cut through better and quicker. These are all-wheel mowers that are quite heavy to drive around. They have the capability to cut through grass quickly but their weight can be a challenge when you are going uphill. Make sure that you buy this model only when you are planning to mow a flat lawn because, with so much weight, it will be difficult to maneuver the mower on various parts of the lawn. Those who find it extremely difficult to use a push mower or take a lot of time to mow a small lawn, it will be better to buy a riding mower. This type of mower will offer the basic facilities of mowing. They are just push mowers with an electric motor in the rear end so that you can drive the mower instead of having to push it around the lawn. In fact, this can be a cost-effective solution if you don’t want to spend a huge amount on a mower but want to get the job done somehow. They are easy to operate and can mow small gardens very quickly. Depending on the size of the mower, you can look to spend between $600 and $1000 to get one of these mowers for your garden. Buying a lawn mower can be a big investment. You will have to decide what the priorities are and then find the right type of mower according to the different features given above. 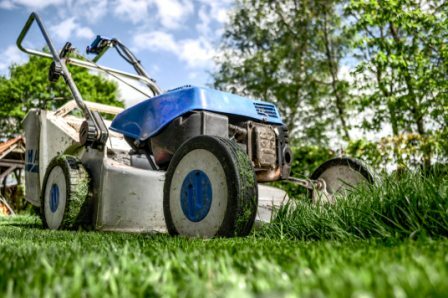 There are several varieties of mowers from different brands that you can get but the size of the lawn and the comfort that you want to get while cutting the grass can be two big factors to decide which type of mower will be best suited for your garden.